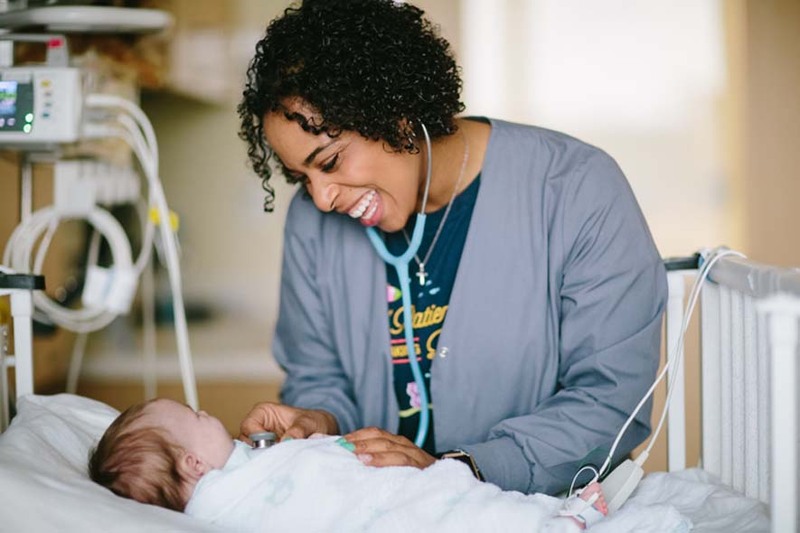 April 15, 2019 | By Fatima V.
Children’s Health has talented photographers, Lori and Juan, who capture our commitment to make life better for our patients and families. Their work is being recognized and featured in this year’s Children’s Hospital Association National Photo Exhibit. Of the 50 photos included in the exhibit, these two photos were chosen as ‘Top 10’ and will tour the country in a traveling display. View the gallery and our 3 other photos included in this exhibit. 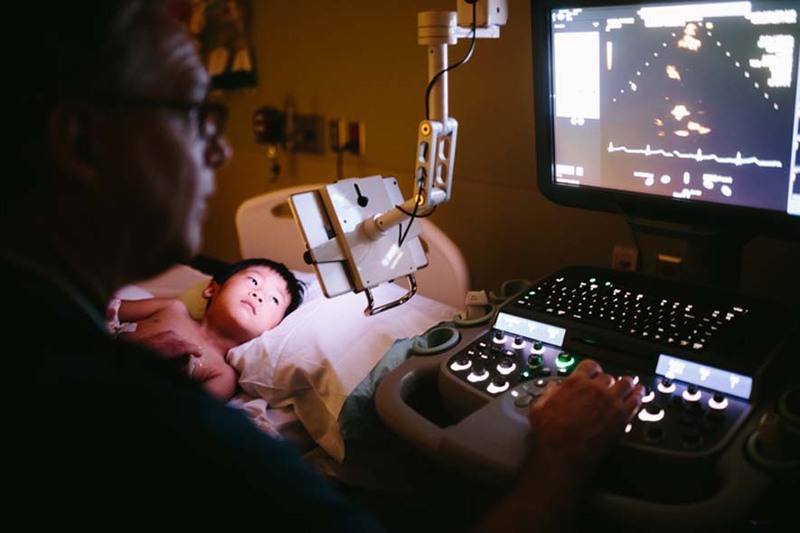 A young boy watches a movie on a tablet as he undergoes a transthoracic echocardiogram in the Heart Center at Children’s Medical Center Dallas. The procedure is performed by an imaging technician while a cardiologist watches the scan in real time. By creating a safe and comfortable environment during these procedures, pediatric patients can relax and remain calm. 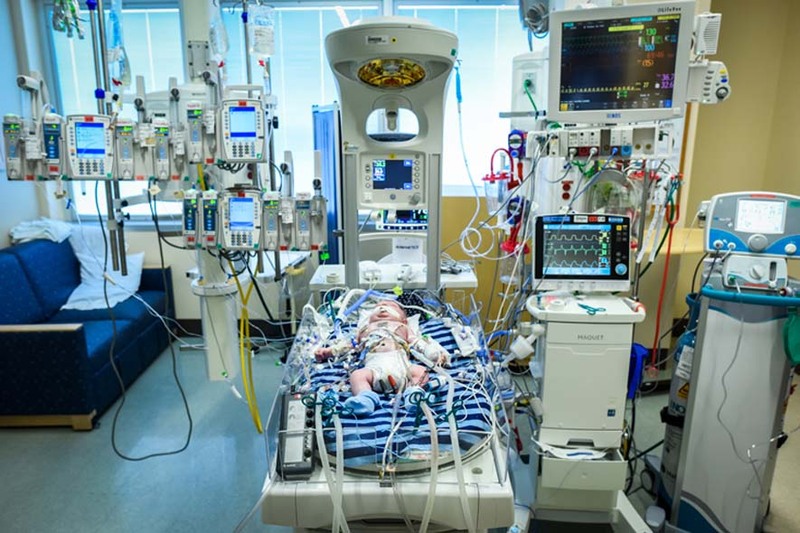 Children’s Medical Center Dallas, the flagship hospital of Children’s Health, is ranked seventh in pediatric cardiology and cardiothoracic surgery by U.S. News & World Report. 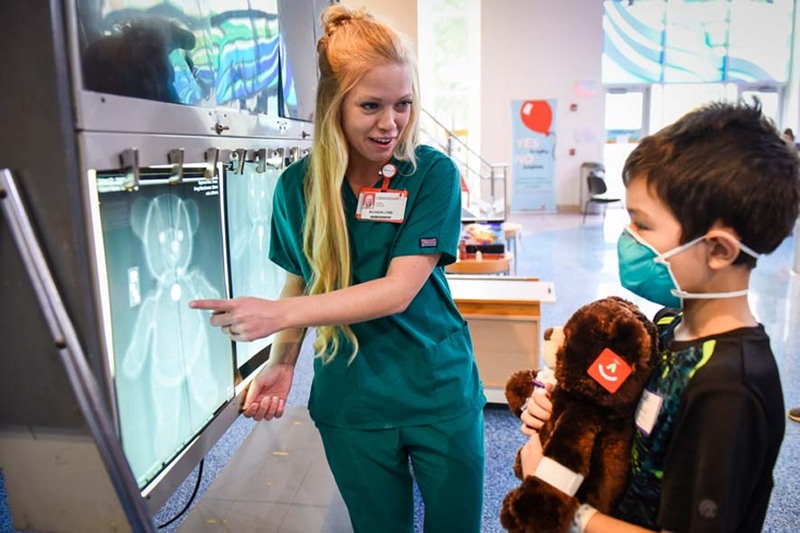 With more than 13,000 outpatient clinic encounters and over 14,000 inpatient admission days in 2018 alone, the Heart Center at Children’s Health is leading the way in care. Three-month old Allison lies in the Cardiovascular Intensive Care Unit at Children’s Medical Center Dallas as her mother holds her hand. 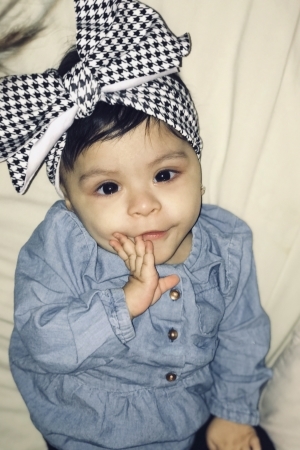 Allison, diagnosed with hypoplastic left heart syndrome (HLHS), had one open-heart surgery and a pacemaker installed when she was just 5 days old. 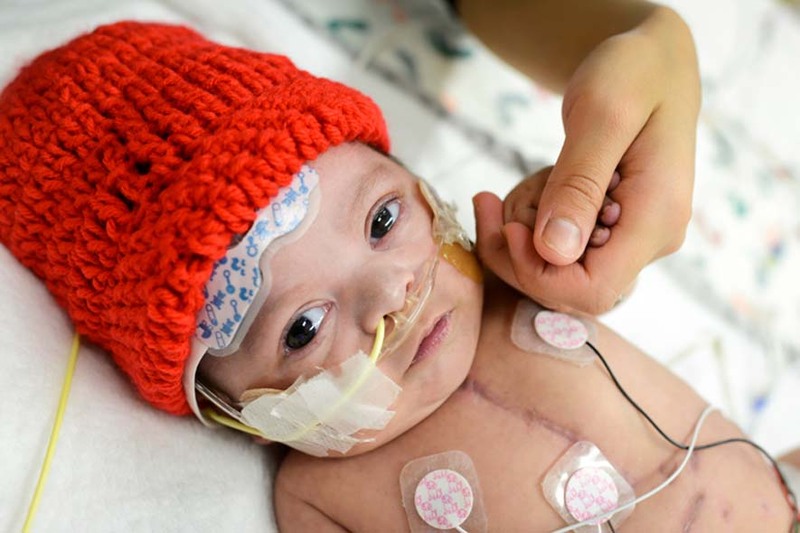 Her cardiologists determined that it was too risky to complete the series of surgeries she would need to create a new circulatory circuit that would transmit the oxygenated blood her tiny body needs to survive. Allison’s blue fingertips, seen in this photo, and her erratic heart rate were some of the symptoms that led physicians to place her on the heart transplant waiting list instead. Allison received a new heart two weeks after this photo was taken. Her mother calls Allison’s recovery “bumpy,” requiring extra days in the cardiovascular intensive care unit. In mid-March of 2018, after spending the first few months of her life in the hospital, her cardiologists finally cleared her to go home. Today, Allison visits once a month for check-ups. In 2018, Allison was one of 26 heart transplants performed at Children’s Medical Center Dallas. The same year, Children’s Health celebrated the 30-year anniversary of the cardiac transplant program, achieved the best one-year post-transplant survival rate in the U.S., is currently the busiest cardiac transplant center in Texas and the second busiest of all 50 centers in the U.S. Children’s Health is a training center for heart failure and transplant cardiologists, preparing future generations of physicians with the knowledge and skills to treat patients like Allison.